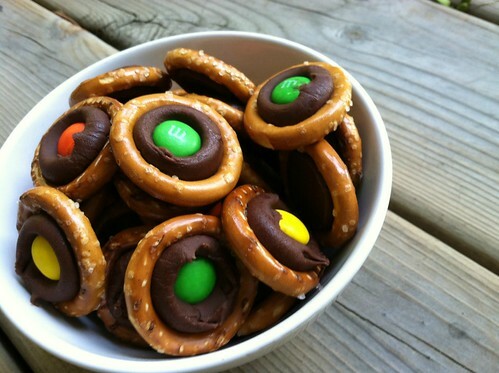 Over the years, one of my favorite salty + sweet treats are the pretzels + Hershey’s Kiss + M&M candy (here’s my ‘recipe’). I love them all year round, but especially during the holiday season. They seem to be a hit for almost any party or occasion, everyone loves them, they are great for little hands, and they freeze well so I can easily make a couple hundred at a time! 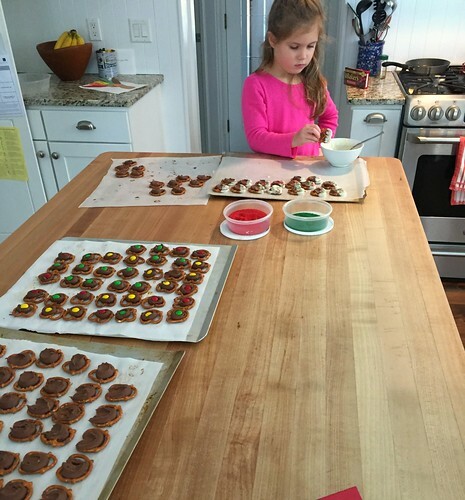 My kids LOVE these chocolaty pretzel bites; however, a couple months ago, we tried making the same concoction… but we used Rolo candies instead of Hershey’s Kisses. The gooey caramel + crunchy pretzel + sweet chocolate + salty pretzel is one of the best combos I’ve had in a bite-sized snack in a very, very long time! 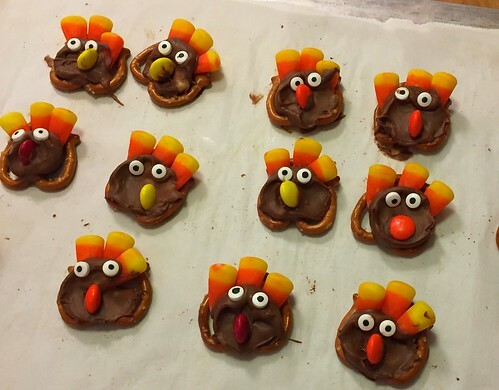 We all loved the Rolo candy addition so much that we even made them into turkey’s for Thanksgiving! 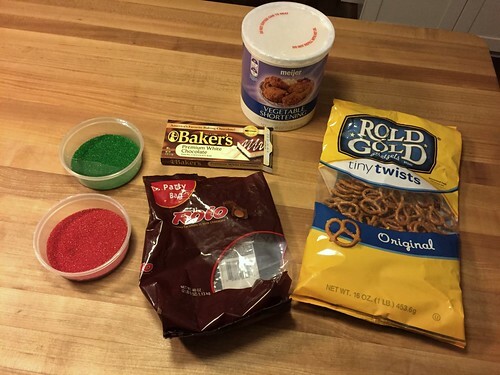 Then, a few weeks ago, I saw a Facebook post that gave me another idea to kick our favorite bite-sized treats up a notch again. We dipped them in white chocolate! The white chocolate added a whole new flavor combo — one that is rather addicting, I might add! 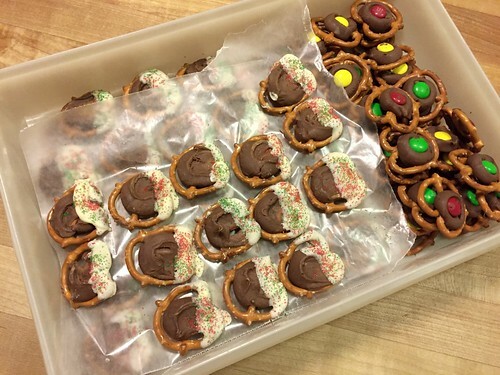 I currently have a couple large food storage containers filled with these yummy pretzel candy bites — and I’m quite confident we won’t have many left after taking them to various holiday parties over the next week (and snacking on them at home). 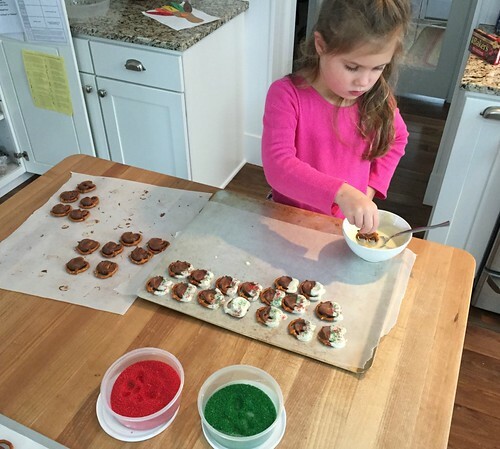 The best part about this recipe for me is that my 5 year old made these treats almost completely on her own! I told Nora exactly what to do, I put the pans in the oven, and I melted the white chocolate — other than that, she did everything else while I was making soup for dinner! 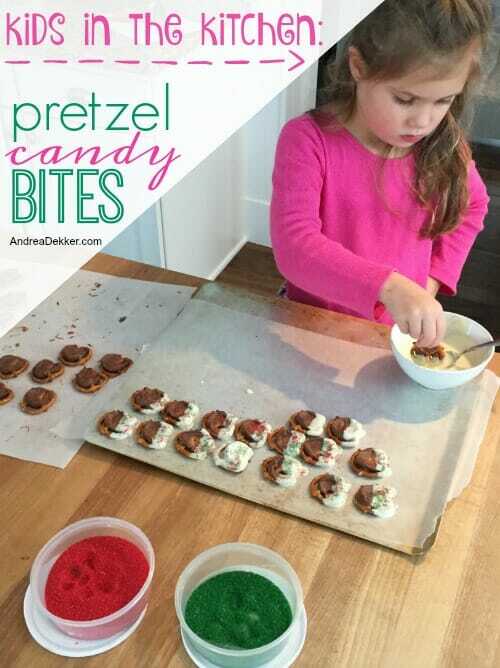 If you’re looking for an extremely simple, super delicious treat to bring to a holiday party, or just something fun to do with your children or grandchildren over Christmas break, I don’t think you can go wrong with these yummy pretzel candy bites! Let sit for about an hour (or until chocolate is no longer melty) and store in an airtight container with sheets of wax paper between the layers. These bites are such a fun treat any time of year, but with a sprinkling of red and green sugar, they are the perfect munchy to bring along to all our Christmas parties! What are your favorite Christmas munchies? Simple Meatless Meals... for people who love meat! yeah, she is looking a lot older lately! haha — thanks! I do actually make all my “kids in the kitchen” recipe WITH my kids. Sometimes it gets a little messy, but usually it’s not too bad. 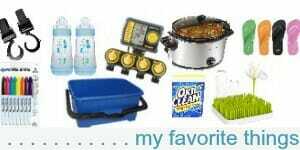 I enjoy baking and cooking with my kids, but ONLY if we don’t totally trash the kitchen! Curious…Have you ever substituted coconut oil for the shortening? I’ve made the magic shell with coconut oil and chocolate chips and it mixes well, but I’m not a baker and not too keen on buying a whole can of shortening for 1 tsp. 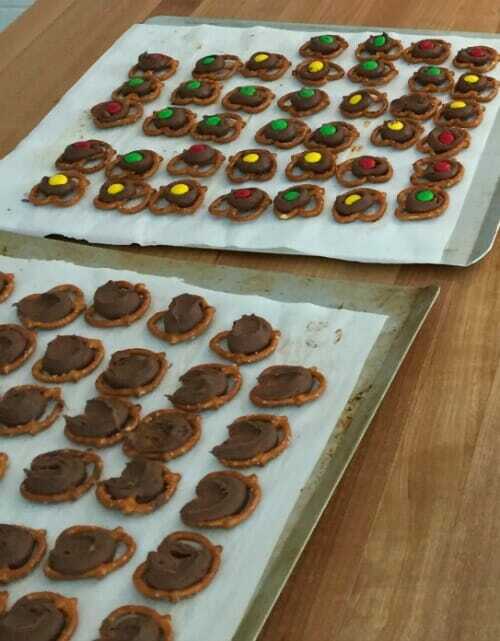 I love chocolate and pretzels, but only used the melts in the past. This looks really good. Thanks. 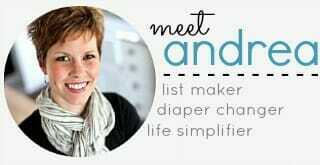 Merry Christmas to you and your lovely family….been following you since you became pregnant with Nora and I’m always quoting you to my husband…all I have to say is your name and he knows who I’m talking about ☺ Love your blog! I’ve never done this, but I’m pretty sure it would work. Even butter might work, but I don’t know for sure. Merry Christmas to you too! and thanks for your long-time readership! Can I hear how you do the “Magic Shell”? I’ve made these for years too! The Rolo variety is fun with a pecan on the top too! Merry Christmas! 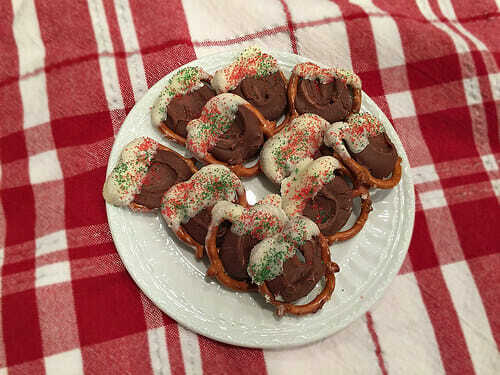 These are also good with another pretzel on top. You use the second pretzel instead of a spoon. I use the “waffle” type pretzels. They gave more area, if that makes sense. I forgot to add – I do the Rolos. I guess that wouldn’t work for the kiss and M&M one, plus it’s prettier to end with the M&M on top. Yes, less messy, but also less chocolate-to-pretzel ratio 🙂 We like lots of chocolate! !